You are here: Home > News > *EXTENDED* Invitation to Tender: Lead Consultant, Old Museum Building: Back to Life Project. *EXTENDED* Deadline for submission of tender has been extended to Monday 4th February 2019 at 12 noon. 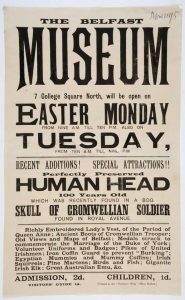 In 1830-31 the BNHPS built the ‘Belfast Museum’ at 7 College Square North to support its aims, display their collections and hold meetings. BNHPS remain the proud owners of this important historic building, now known as the Old Museum Building (OMB). The OMB has been largely vacant since 2011, is on the Heritage at Risk Northern Ireland (HARNI) Register and requires restoration and reuse. 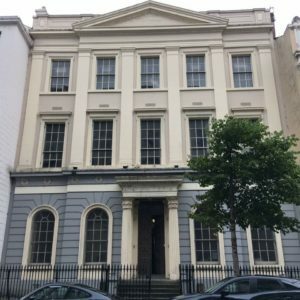 BNHPS has agreed to work in partnership with current tenants, Ulster Architectural Heritage to find options for the building’s restoration and reuse. The UAH and BNHPS partnership is currently seeking an experienced and well qualified consultant to lead stage 1 of this project. The brief includes working with committees and staff of UAH and the BNHPS, and sub consultants, and to consult with other stakeholders in order to complete comprehensive research and reporting with regard to a minimum of 3 outline proposals for the building’s sustainable future restoration and reuse. Full information via link below. The Belfast Natural History & Philosophical Society (BNHPS) was founded in 1821 to promote knowledge in the arts and sciences. BNHPS is membership organisation, with the prime objective of ‘the promotion of learning and research in the arts and sciences, and in history and literature’. BNHPS provides an annual lecture programme, as well as a small publications programme. It also supports research and publications about Ireland and Ulster’s cultural and material environment. The Society provides a forum for debate on important cultural issues, reflecting the intellectual life of Belfast and Ireland. Currently BNHPS has approximately 130 members. Find out more about BNHPS here. The UAH was established in 1967, and continues to have a growing remit in promoting the historic built environment, its protection, conservation and regeneration in Northern Ireland and across the 9 counties of Ulster. Like BNHPS, UAH is a membership organisation with approximately 1000 members. UAH manages an annual events programme of over 20 events a year, with attendees of over 1500. UAH is also one of the lead publishers on architectural heritage in Northern Ireland. For over 25 years, UAH has managed the heritage at risk register for Northern Ireland in partnership with the Department for Communities, and administrates the Heritage Angel Awards for Northern Ireland, supported by the Andrew Lloyd Webber Foundation. Find out more about UAH here. This, stage 1 of the OMB: Back to Life project is supported by the HLF Resilient Heritage fund. The project will take place between February and September, 2019. It is envisaged that the total fee should not exceed £15,000 ex. VAT. Invitation to tender has been extended and will be open until Monday 4th February at 12 noon . Where applicable, interviews for shortlisted tenderers will be scheduled week beginning 4th February, 2019. Download full tender document here. Nicola McVeigh, Chief Executive, Ulster Architectural Heritage, Old Museum Building, 7 College Square North, Belfast, BT1 6AR.